The Gobblet game is an updated version of tic-tac-toe. 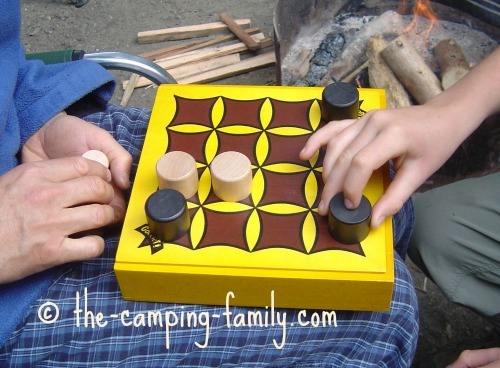 It's one of our favorite board games to play while camping. Here's why it's an ideal game to take camping. The whole game, including the board and the playing pieces, is made of wood. The pieces are durable enough to survive being dropped from the picnic table or rolled on in the tent. On one rainy camping trip, we sat under a sheltering tree and played a lot of Gobblet. The occasional raindrop that reached us didn't hurt the game at all. The game isn't bomb-proof, though. You won't want to let anyone stand on the box, but it is sturdy enough for its intended use. The Gobblet game has a clever design. 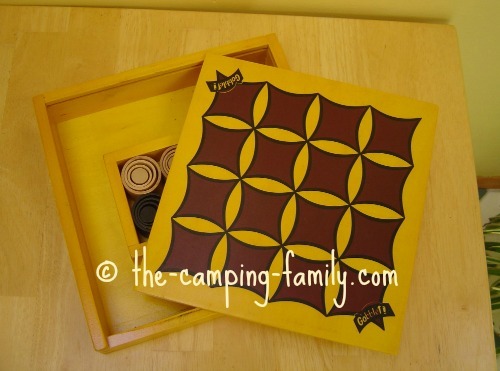 The pieces are stored inside a wooden box, which becomes the game board. I don't generally recommend games with small bits for camping, but these pieces are easy to keep track of. They are heavy enough that they don't blow around and won't easily get lost. The pieces nest inside one another. When you are packing up, you can see at a glance if any are missing. The game board can balance on the players' knees. This makes the Gobblet game perfect for playing beside the campfire. The basic rules for Gobblet are very simple: try to get four of your pieces in a row. On your turn, you can either place a new piece on the board, move one of your pieces to a free space on the board, or "gobble" one of your opponent's pieces. You can learn the rules and be playing your first game in minutes. .... and it has opportunities for strategy. Once you have mastered the basic rules, you'll discover that the Gobblet game is not nearly as simple as it appears. You'll need to look ahead, just as in chess, and try to predict what your opponent will do. Every game is different, and every game is surprising. Small children can easily learn the game, but it is challenging enough to keep teenagers and adults interested too. Since kids seem to have better focus and memory than many adults (please tell me that I'm not the only one who has noticed that! ), they can often hold their own in a match against an older person. A game doesn't take long. A typical game takes anywhere from one to twenty minutes. You can have a quick game, and then go to the beach! Although only two people can play at once, that's rarely a problem. When we have several people wanting to play, the winner plays the next person in line. Since every match is different, we never get bored with this game. You too will probably want to play again and again, from morning till night! This isn't something I look for in a game. Games are supposed to be just for fun! But have you noticed that the games that are the most fun are also the ones that engage your brain and make you think? Gobblet definitely does that! It probably also develops your logic, attention span and memory - but feel free to ignore all that and just enjoy playing. Blue Orange, the company that makes Gobblet, plants two trees for every tree they use in the making of their games. They have other cool environmental policies, too. We're not the only ones who have noticed what a great game Gobblet is. It has won at least 12 important awards, including the Parent's Choice award, the Oppenheim Best Toy Award, and the Dr. Toy Award. Gobblet can be quite addictive! Don't be surprised if you and your opponent want to have just one more game … and then just one more … and then really, just one more - while the rest of your family waits impatiently, holding the beach toys and tapping their feet. There are several versions of the Gobblet Game. This is the version that we love. It uses a 4 x 4 grid, and has lots of play value. We were delighted to find this travel version. We took it along on a backpacking trip - but were quickly disappointed. It turns out that the travel game uses a 3 x 3 grid rather than the 4 x 4 grid we were expecting. What the big deal about that? Well, as we discovered after playing a few games, the person who goes first can always win! This is geared towards children aged 5 to 12 - but, like the travel game, it uses a 3 x 3 grid, which means that whoever goes first can always win. This would be suitable for really young children, but all of the 10-12 year olds I know would figure out the trick in just a couple of games - and after that, it wouldn't be fun anymore. This is essentially the same game as Gobblet Junior, redesigned to appeal to kids aged 5 to 8. Like Gobblet Junior, it has a 3 x 3 grid, but instead of wooden pieces it uses brightly colored plastic characters. It has the same problem as all the 3 x 3 versions: whoever goes first can always win once the trick has been discovered - but that's probably not an issue for the youngest players. Definitely get the original game. If you have small children, you might also want to get one of the other options. Playing any of them would be a good way for little ones to learn the game. Once they are confident, switch to the "big kid" game. 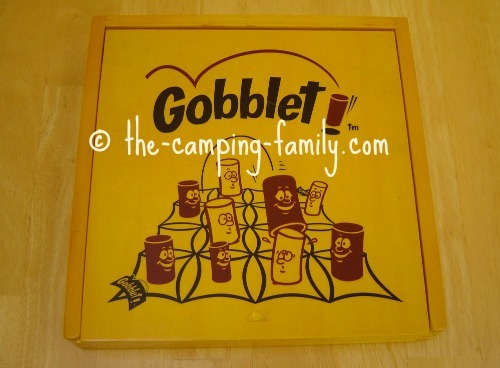 Now that you know why I think the Gobblet game is perfect to take on a camping trip, read about more of our favorite camping games here. Planning a camping trip? 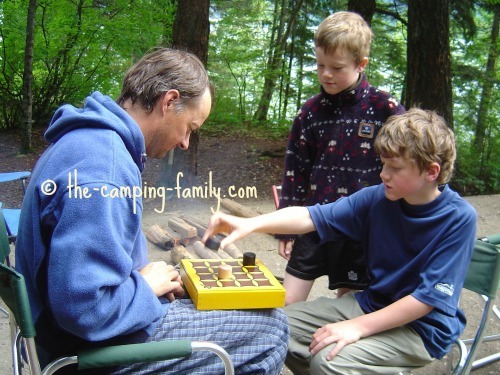 Visit The Camping Family home page. 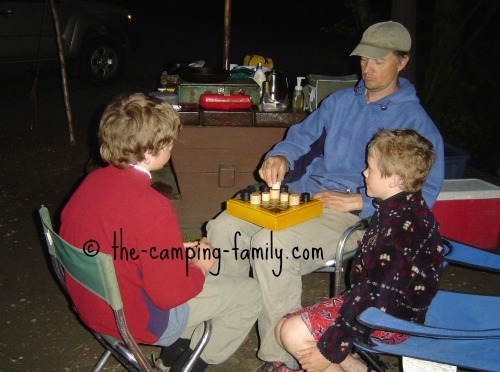 I have lots of camping food ideas, fun activities, packing lists and more.